Finding your perfect t-shirt can take a lifetime. Ruining it is the work of seconds. There are, presumably, worse things that can happen to a man than a wrecked tee. But when your washing machine spits out your favourite t-shirt at toddler size, it’s hard to think what they might be. To help your tees last longer, our expert stylist Alice Watt has spotlighted some of the easiest ways to wreck them – and what you should do instead. If you’ve always ignored the label advice to wash your t-shirts inside out, now’s the time to change tack. “It helps retain the colour,” says Alice, “and also means that if you do get bobbles from the friction of other clothes, they’re only on the inside.” If no one can see them, your t-shirt’s not ruined. 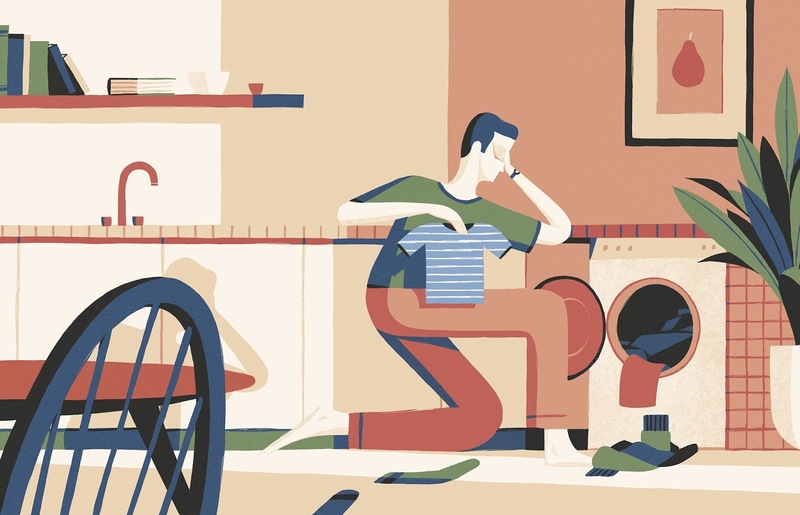 Hot washes can wreck your energy bills and your clothes. “Most detergents can get stains out at 30ºC,” says Alice. “So stay safe.” Cold temperatures will also keep dark tees darker, because less dye runs out. Conversely, to keep white tees sparkling, wash at the hottest temperature the label says is safe. Or just use a whitening detergent. If the heat in your washer doesn’t shrink your t-shirts, then your dryer will. “They can also fade and bobble,” says Alice. Instead, lay tees flat on a towel, roll them up and squeeze any excess water out, then unfurl and air dry, ideally flat. Water makes them heavier so they’ll stretch if they’re hung. The same is true of the hangers in your wardrobe. “Especially with wire hangers, which can make t-shirts lose shape,” says Alice. “You’ll also get annoying marks in the shoulder.” Instead, fold them and stack in a drawer (or, if you’re short on space, roll). Your older t-shirts probably share one annoying characteristic: the necks are stretched out of shape. If you’re wondering why, then imagine taking one off – where are you hands? “If you’re pulling tees over your head by the neck, they’re going to get damaged,” says Alice. “And once they’re stretched out, there’s no way to fix them.” Instead, grab them by the hem with two hands and pull up and over your head. Unless you’ve got the skull-to-body ratio of Mr Potato Head, your crew necks will no longer morph into deep Vs.